Hotel Las Cuevas (The Caves Hotel), founded on May 20th of 1956, is sited on an elevation, with a group of caves that form an extraordinary labyrinth of stalagmites and stalactites and, so I am told, are full with spells and legends of the colonial time. 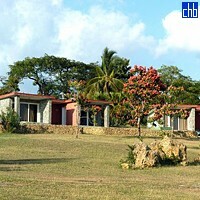 For many years the motel-style Las Cuevas, on the hill overlooking Trinidad and near the Sugar Mills Valley, both declared World Heritage by the UNESCO in 1988, was the only hotel in town. 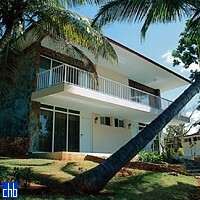 The location offers the advantage of receiving refreshing breezes, and the views over town towards the Caribbean Sea are no less refreshing. However, it's a stiff walk up and down the hill to and from town, and the distance barely justifies a taxi. 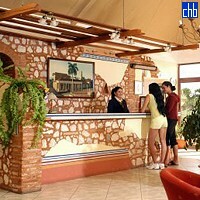 It is a ten minutes drive to visit Ancon and Maria Aguilar beaches. 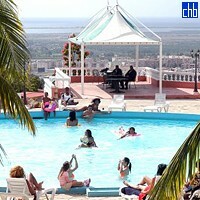 When not exploring Trinidad's important historical-cultural sites such as the Major Square, Santa Ana’s Church, and the Romantic and Municipal museums, guests can lounge by the circular pool further up the hill. 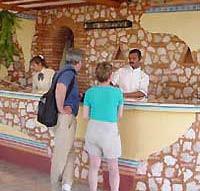 The pool is served by a snack bar and open-air games room, plus there's a gift shop. 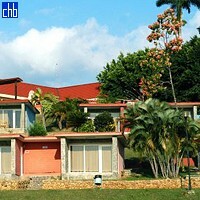 The Las Cuevas Hotel main building features the buffet restaurant, where live musicians sometimes do the rounds. The high point is the nightly cabaret, and its just a short (but disconcertingly dark and lonely) stroll to the hotel's disco inside the eponymous caverns. 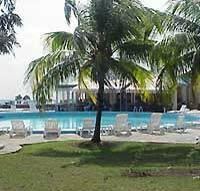 The hotel also has a tennis court, parking lot, medical services, money exchange, car & motorcycle rental, children’s swimming pool and tourist bureau. 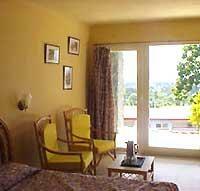 Accommodation is in 110 rooms in duplex bungalows tiered upon the hillside. Though recently refurnished with floral fabrics, they're still a tad dowdy and uninspired with their simply rattan and bamboo furniture. Three have king-size beds. Bathrooms, however, have modern fittings and all rooms have satellite TVs. 쿠바에서 가장 잘 보존된 식민 도시로 에세캄브래 산맥으로 인하여 이곳은 1950년까지 세상과 동떨어진 곳이었다. 쿠바정부에 의하여 국립공원으로 정해진 이 곳은 4세기 전의 도시가 그대로 살아있고, 바로크식의 건축물들과 조약돌들로 이루어져 트리니다드가 캐리비안의 식민지의 중심이였었던 과거를 추종하기 쉽다.